I found a way to have my state contract and beat it too. I have a subcontractor to fill in on my contract at the State of Illinois. Now I am a dirty-rotten-capitalist making money off the labor of others. Meanwhile I am a contract worker at a large insurance company in Bloomington. The insurance company will remain nameless because they have too many lawyers for me to risk their displeasure. I bet the actuarial department knows how many lawyers can dance on the head of a pin. Lawyers are easier to come by than angels. My husband is working for the same insurance company. He has been there for several years. He has been commuting 65 miles one-way each morning and evening. We will be moving soon. So he will get a part of his life back. Meanwhile, until the move is behind us, knitting is not in the picture. Christmas is coming soon and my annual ordeal approaches: the in-laws and the outlaws. This year throw in packing boxes. Serve with garnish. For years we have had my husband's family for Christmas because we have the house big enough to hold them all. Then last year I had my Dad also. It was the first Christmas since my Mom died so I couldn't leave Dad out. The problem is that my Dad cusses without a thought and my in-laws are just a wee bit this side of being Mennonites. Among my in-laws, no one is allowed to have a television; the women must wear skirts or dresses and never cut their hair or wear makeup; and no one wears anything except long sleeve clothes year-round. My father is mostly deaf so conversations with him get a little loud. I could just picture my Dad dropping a few loud choice words into a conversation with a group of people who wouldn't say s*** if they had a mouth full of it. Christmas at my house could have turned into a reality TV show. So I compartmentalized. My Dad was there for noon and the in-laws for the evening. And I wore blue jeans just to keep my identity straight. Allegedly the contract staff are getting a stay of execution from the governor of Illinois, but not a pardon. They are giving us all a 90 day extension. At the end of 90 days we are supposed to either (1) be converted to state employees (that'll takes a lot of pixie dust); (2) become temporary employees (of course, we were already temporary, but that depends on the meaning of temporary. Although I've been here for years, compared to the Age of the Dinosaurs, I'm temporary); or (3) be gone. Let's just suppose the contract staff become state employees. How many of them will become clock-watching, break-taking, never-take-a-leak-on-your-own-time, grievance filers. It's not a natural role for contract staff but most contractors have proven that they can be trained. I know what I'm talking about. I used to be a state employee. I got in trouble for working through my breaks. The clock-watching, break-taking, never-take-a-leak-on-your-own-time, grievance filers take great care to ensure that no one makes their lethargy noticeable by comparison. So I quit. On my 40th birthday, I gave up my oh-so-safe, boring state employee job. I became a consultant, one of the undead. Some people thought I was crazy. But how crazy was I? I went to work for the state as a outside consultant for twice the pay. I may have been crazy but I wasn't stupid. It is time to pad the pension. I am working on a yardage calculator. It will probably take me several days to build the database for the calculator. I plan to have select lists for style, size, yarn type, stitches/inch and rows/inch. Then the user would enter the yarn name and the yardage per skein. 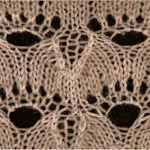 The result would be the recommended number of skeins to work the garment. I have researched several sources for information on the yardage for a given size/style. The time consuming part is collating all the resources into the database. Will code ColdFusion and/or SQL for food. If I am not the goddess of knit-and-rip, it is not for lack of trying. I had almost finished a sweater for #1 son. It was a design experiment. The design was working but it just didn't look like anything #1 would be caught dead in. RIPPPPPPPPPP; Wrap; Start a new design. It makes my husband and kids crazy when they see me ripping out another sweater. They think the objective of knitting is the sweater. They don't understand the objective of knitting is the knitting. I began knitting when I was 8. Barbie doll clothes. I learned to knit from the Coats & Clark learn-how book. For some reason I learned the Continental method. The instructions were English style. I don't know how I made the switch. My mother knew how to knit but did not enjoy it. Every time she set her knitting down, when she picked it back up, she had no idea where she was at. Her passion was for the sewing machine. I hated the sewing machine. My mother and I had a deal: if anything happened to her, I was to go to her house and hide her stash of fabric, so folks would not find it and think she was nuts. Likewise, if anything happened to me, she was to hide my stash of yarn. When she died about a year ago, she left me about 2 pickup truck loads of fabric. [Here in fly-over country, a pickup truck is an acceptable unit of measure.] I am still trying to figure out what to do with all of it. Today, I went to see my Dad. I worked up his tax return. He has been ill lately and is not fully recovered. My daughter, Laura, went with me. She got out a box of old photographs. These were the wedding pictures of my aunts and uncles from the WWII years. No big weddings. No white silk dresses. Since my mother died, my cynical core has been penetrated; those pictures bring up the tears. Yesterday was a system engineer nightmare. We had memory failure on one server. Then as the memory was being replaced, someone (it wasn't me; I was upstairs in the BatCave) accidentally disconnected power to the production SQL Server. It went down hard and came back slow because of all the recovery processes going on. All the web sites were dependent on this server. They were all down for about 20 minutes. It sure made the case for database redundancy. Wake up managers. Let the moths out of your wallet. I just had to come home and knit. If I didn't knit, I would probably drink way too much. There's a thought: knitting as the 13th step of an AA program. Today was much better. We had a little domain controller hiccup, but not a big deal. All quiet in the BatCave. Hurrah.